December 2014 - It is almost the end of another year! The month of December is a time when there are lots of social gatherings, where many of us come together around food and drink, to reconnect and to celebrate the year that is about to be over. During this holiday season, we wanted to take this opportunity to celebrate friendships and partnerships. 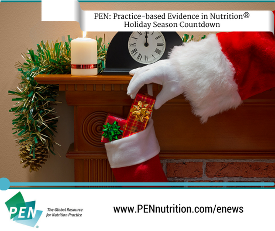 Inspired by the Evidently Cochrane group’s Evidence Advent Calendar from 2013 we will count down the holiday season by posting PEN® evidence that is related to holiday season-inspired photos. 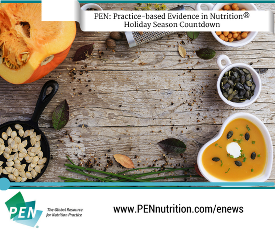 PEN® is the Global Resource for Nutrition Practice. As such, we are publishing content across several time zones. 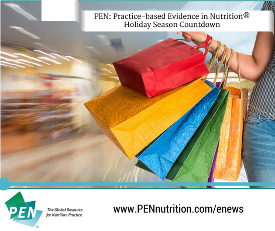 Depending on where you are, you may consume your holiday PEN® evidence on one day, while also being able to get a sneak peak for PEN® evidence the next day! Where ever you are in the world, we hope you will enjoy opening up a new post each day, any time of day, now through December 24th. Many dietitians recommend that families try and eat at least one meal together each day. Dinner time provides an opportunity to communicate and build relationships, but are there authentic health benefits from this practice? Whether it is a turkey dinner, a BBQ, a cold buffet, an array of salads, brussel sprouts, mince pies or stone fruits (plums, apricots, cherries, mangoes, avocadoes), seafood, gingerbread and ice-cream pudding, enjoy the foods that form the basis of your unique holiday meals. 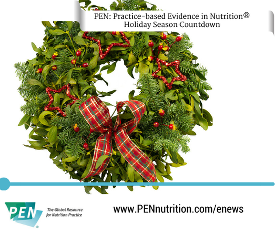 From the PEN® Knowledge Database family, we wish you and your family a happy and healthy holiday season. If you have invited family or friends to dinner on Christmas day, you may be planning to roast a turkey. However, most turkeys are available frozen, and will require time to thaw out. What is the best way to thaw a turkey? Frantic last-minute shopping, entertaining the in-laws, listening to “Jingle Bells” for the umpteenth time… the holiday season is rife with triggers for those prone to migraines. However, some individuals can also be triggered by dietary factors. Dietary advice for migraineurs often consists of identifying and avoiding personal dietary triggers, which may or may not include alcohol, various cheeses, chocolate, processed meats, artificial sweeteners, and fatty foods. Others report that fasting, missing meals and dehydration trigger their migraines. However, few experimental trials have been conducted in this area and, overall, evidence is limited or even contradictory for a cause and effect relationship. 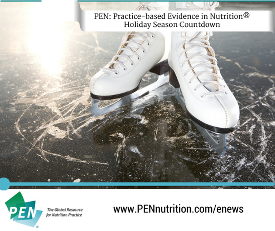 For more information on dietary triggers for migraine among migraineurs: http://www.pennutrition.com/KnowledgePathway.aspx?kpid=11148&pqcatid=146&pqid=9068&kppid=9069&book=Evidence#Evidence Even so, making time for regular meals and staying hydrated will make sure you have enough energy to survive the holiday season. In the Southern Hemisphere, it is summer, while in the Northern Hemisphere, we are starting winter. Catching a cold is easy to do in December - crowded ski hills, Christmas pageants, and shopping mall crowds are all ways you could be exposed to any number of nasty viruses. Does vitamin C have a role in preventing or treating the common cold? So instead of taking a supplement, make sure to wash your hands frequently to avoid a case of the sniffles. Mindfulness and awareness have been incorporated into many therapies, and have recently been applied in nutrition counselling. The practice of mindful eating is defined by paying attention to an eating experience with all our senses (seeing, tasting, hearing, smelling, feeling); witnessing, without judgment, the emotional and physical responses that take place before, during and after the experience. The focus is more on how to eat, and less on what to eat. But does the inclusion of a mindful eating approach in counselling truly result in improved adherence to diet therapy? 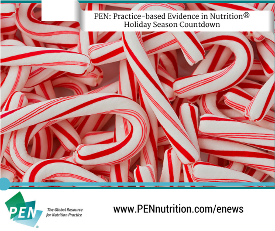 Curved red and white candy sticks are a familiar sight during the holiday season. Whether adorning a Christmas tree, embellishing a neighbor’s front lawn, or flavouring a hot beverage, the peppermint flavour is omnipresent. Peppermint tea has commonly been used to relieve gastrointestinal discomfort. Some individuals with irritable bowel syndrome (IBS) may have also considered using it to alleviate their symptoms. In parts of the world, eggnog is a popular holiday seasonal beverage, sometimes enjoyed on its own, in a latte, or with a splash of rum, topped with nutmeg. Eggs are an excellent source of high quality protein, iron and B vitamins. Eggs are used in making eggnog. However, many people avoid eggs due to the high cholesterol content within the yolks. 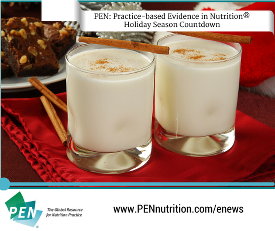 One cup of eggnog has 158 mg of cholesterol, almost as much as an egg! Should eggs be avoided to reduce the risk of cardiovascular disease (CVD)? 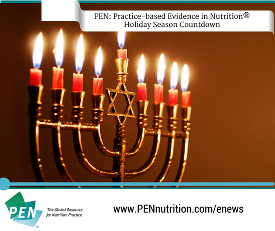 Hanukkah, the Festival of Lights, begins on the 16th of December this year and ends after eight days of celebration. This Jewish holiday commemorates both the military victory and a miracle. As the Jews purified the Holy Temple after the defeat of the Greek-Syrian army, they found only one flask of olive oil for the eternal lamp — enough to keep it burning for just one day. But a miracle occurred, and the oil lasted eight days and nights until more oil could be brought from afar. For this reason, many people celebrate Hanukkah by making fried foods such as latkes (potato pancakes) and sufganiyot (jelly-filled doughnuts). Olive oil is still a popular cooking oil due to its high concentration of heart healthy unsaturated fats. However, coconut oil has recently become a popular food, claiming to be metabolized differently than other saturated fats found in animal products. Are there any proven health benefits in consuming coconut oil? 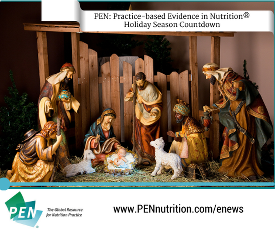 Christian Nativity scenes often include several farm animals that shared the manger with Mary and Jesus. One of these animals may be a goat, which produces milk with a slightly different protein structure than cow’s milk. For this reason, some have used goat’s milk as an alternative to cow’s milk for infant complementary feeding. What are the recommendations for the use of goat's milk in infant feeding? Goat’s milk is not a suitable alternative for infants with cow's milk protein allergy. Goat's milk is higher in electrolytes and protein and lower in folate compared to breastmilk. Case reports of whole goat's milk diets fed to infants have described electrolyte imbalances, metabolic acidosis, megaloblastic anemia, antigenicity and mortality. In Canada, goat’s milk is not recommended for infants younger than nine months of age as an alternative to breastmilk or infant formula. When infants are over 9 to 12 months of age and consuming a variety of iron-rich foods, full fat goat's milk fortified with vitamin D and folic acid may be an alternative to cow's milk. Marzipan, multi-colored candies, cakes, cookies, squares - the combination of sweet treats and gifts may make children very excited during the holiday season. 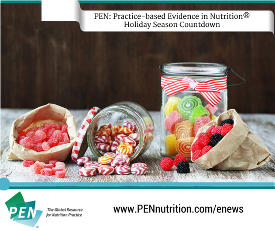 Does sugar influence the behavior of children who are hyperactive or have ADHD? However, added sugar offers no nutritional benefit and can displace more nutrient dense foods in the diet. To encourage adequate nutrient intake, while avoiding excess caloric intake, healthy eating guidelines recommend that high sugar foods and beverages be limited. Food insecurity is exacerbated during the holiday season. Several factors affect an individual’s ability to secure a consistent food supply: income, education, housing, geography, as well as other factors. Chocolate is a common gift around the holidays. Children may also find it in their stockings on Christmas morning – a gift from St. Nick. Although cocoa and chocolate contain sugar, saturated and trans fats, they also contains flavonols, a powerful class of antioxidants. However, the cardiovascular response may differ in the type of chocolate consumed. 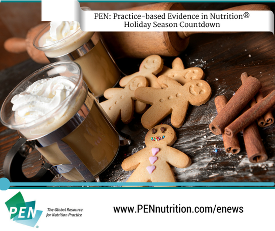 Cocoa and chocolate products differ in flavonoid content, with laboratory analysis revealing that the highest levels of flavanol compounds are found in cocoa powder and baking chocolate followed by baking chips and dark chocolate bars. 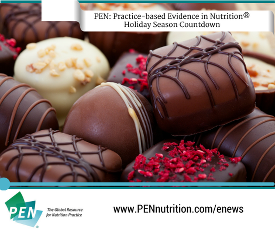 Therefore, dark or unsweetened chocolate or cocoa, with at least 60% cocoa solids, can be part of a healthy diet when consumed in moderation.http://www.pennutrition.com/KnowledgePathway.aspx?kpid=6425&pqcatid=144&pqid=6350 And remember, fruits and vegetables are a reliable source of antioxidants too! If Santa spends all night delivering gifts all over the world, his lifestyle is not unlike many shift workers. Complications associated with shift work include changes in appetite, trouble sleeping, weight loss or gain, gastrointestinal discomfort, and high blood pressure. However, many of these problems can be avoided. Here are some tips to help you cope with late-night shifts. 2. Although caffeine can help you stay alert, it can also affect your sleep. Switch to decaffeinated drinks at least four hours before bedtime, and limit your caffeine intake to less than 400mg per day. Dehydration can make you feel tired. Stay well hydrated. 3. An alcoholic drink may make you feel more relaxed, but can also disturb your sleep. Try to avoid alcohol after work and when you get home. Sometimes it’s hard to fall asleep when you’re too hungry or full. Have a light snack before you go to sleep to make sure you aren’t too hungry during the night. 4. Maintain a healthy body weight by planning healthy meals and making time for physical activity. Not only will you have more energy at work, you’ll also improve your mood and manage stress better. The opening lyrics of “Christmas Song”, a carol composed Torme and Wells in 1946, describes the ambience of a cozy winter’s eve. Many households may also have a dish of nuts on display for snacking during family gatherings. Chestnuts are lower in calories and fat, and higher in carbohydrate than other nuts such as almonds, cashews, pecans, pinenuts and walnuts. 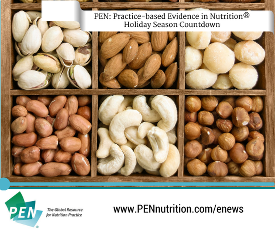 Although this latter group of nuts are high in fat, they contain the “heart healthy” polyunsaturated fats that have a positive effect on blood lipids. Pumpkin – a vegetable that, around the world, is enjoyed in diverse ways. From savory soups, feta and rocket salad and roasted pumpkin, to sweet pumpkin pie, muffins, and lattes, pumpkin seems to be everywhere during the holiday season. Depending on how this food is prepared, some of these foods contain added fat and sugar. However, raw and canned pumpkin contains high amounts of carotenoids. Just ½ cup of canned pumpkin contains 8983 micrograms of beta-carotene! Beta-carotene is a specific carotenoid that is converted to vitamin A in the body, and used in the body to maintain normal vision, promote healthy skin and eyes and a strong immune system. Carotenoids may also reduce the risk of eye disease, some cancers and heart disease by acting as antioxidants. Tempted to take a supplement? There are some risks There are some risks associated with beta-carotene from supplements, possibly because the health benefits of beta-carotene may be due the combination of nutrients in the foods containing these carotenoids and not actually due to the beta-carotene itself. 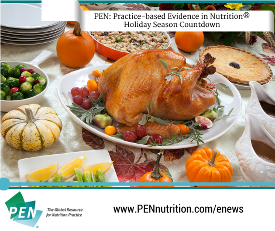 So although everyone can safely eat carrots, sweet potatoes, and carotenoid-rich pumpkin during the holidays, supplementation is not recommended. In parts of the world, children leave sherry, a carrot and a mince pie to welcome Santa and Rudolph. In other parts, children leave milk and cookies. But what if Santa was lactose intolerant? Is there any way he could still enjoy his milk and cookies, without switching to a plant-based beverage? However, the research evidence related to the efficacy of probiotics in the management of symptoms of lactose intolerance is preliminary and inconclusive. Further research with known probiotic serotypes and objective measurements of symptoms are required to determine the effect of probiotic bacteria on clinical symptoms of lactose mal-digestion. Practitioners should continue to provide efficacious recommendations for lactose restriction, such as the use of B-galactosidase-treated milk and other milk products for the alleviation of symptoms of lactose mal-digestion. 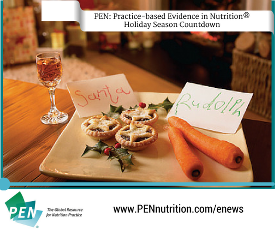 http://www.pennutrition.com/KnowledgePathway.aspx?kpid=1820&pqcatid=146&pqid=3613 What kind of treat will you leave your Santa? Cranberry sauce is a familiar addition to turkey dinner in many families, and add holiday pizzazz to drinks. Other cranberry products – juice, capsules, and cranberry seeds – have been suggested as a way to maintain bladder health. 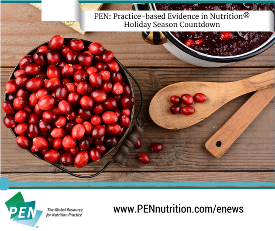 Can ingesting cranberry products help prevent urinary tract infections (UTIs)? Several randomiszed clinical trials have found significant and dose-dependent decreases in uropathogenic bacterial (E. coli) adhesion to uroepithelial cells (ex vivo) in the urine collected from individuals taking cranberry. However, a decrease in symptomatic UTI incidence has not consistently resulted from consumption of cranberry products. There appears to be some evidence of a benefit of cranberry in women with recurring UTIs and children, while no significant benefits are seen in elderly or older adults. Mulled wine and hot apple cider simmer on the stove, while pumpkin pie bakes in the oven. Many traditional holiday treats give off the pleasant aroma of cinnamon as they are prepared. Some researchers have suggested that cinnamon may help individuals with diabetes improve their glycemic control, but are these claims supported by evidence? 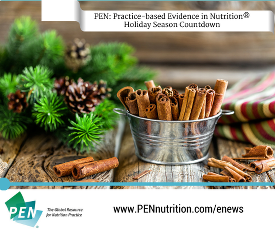 Nevertheless, cinnamon and other “sweet” spices such as nutmeg and cloves are excellent ingredients to add to holiday desserts, as they add flavour to foods without additional calories, fat or salt. Beer, spirits, mulled wine. 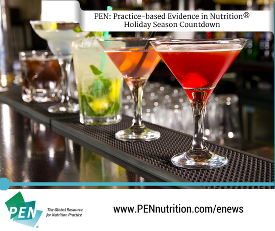 During the holiday season, it is not uncommon to enjoy special red or green cocktails, a cool beer or a warm mulled wine with friends, co-workers and family. What are the health benefits and risks of imbibing alcohol? It appears that “moderation” is the magic word - if you do choose to drink alcohol, limit yourself to one to two drinks [and drink responsibly]. With most coffee shops offering holiday-themed lattes and coffee blends, it’s tempting to use caffeine to power through the holiday shopping. But will your holiday coffee send you running to the bathroom? Many nutritious foods are naturally red and green – apples, strawberries, kale and broccoli can be found in most grocery stores. When planning holiday meals, remember to include many nutritious foods that are naturally red and green – apples, strawberries, kale and broccoli, or a cranberry spinach salad. Clement Clarke Moore’s classic poem “The Night Before Christmas” describes Santa’s belly as being “like a bowl full of jelly”. 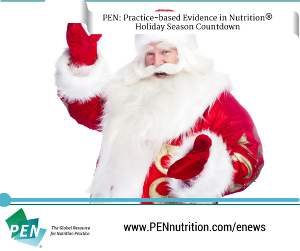 While Mr. Claus’s waist circumference gives him a jovial appearance, it is also indicative of his disease risk. Body mass index (BMI) has traditionally been used to identify individuals who are overweight or obese. However, BMI does not provide information on body composition, or where on the body weight is distributed. BMI is therefore more relevant when considered in conjunction with waist circumference (WC). Together, BMI and WC are reliable anthropometric screening tools that can be used together in order to identify individuals who are overweight or obese and are at an increased risk of diabetes, cardiovascular disease and other related conditions. During this time of the year, we are often surrounded by an assortment of delicious food and drink. 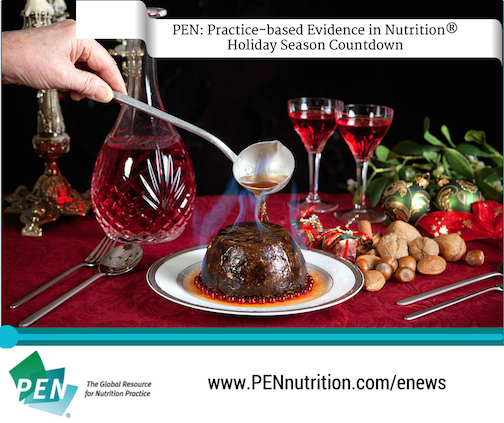 If you’re going to parties this holiday season, you may overindulge on food and alcohol. Cleansing and detoxification are often promoted to improve health, recover from the overconsumption of food or alcohol, or to begin a weight management regimen. Some regimes incorporate the consumption of fruit juices, while others promote the use of herbal laxatives. Is there evidence to support using a bowel cleanse to detoxify your body? Some bowel cleanse product ingredients found in whole foods, such as pectin and psyllium, have shown some effects in maintaining bowel health, but the evidence is inconclusive and medicinal doses may be harmful. There is insufficient data from human clinical trials to support the effectiveness of bowel cleanses made of herbal products in the general, healthy adult population. Therefore, the use of bowel cleanses is not recommended. 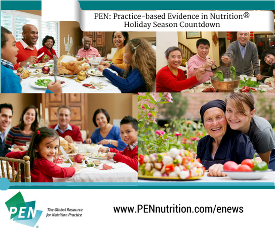 http://www.pennutrition.com/KnowledgePathway.aspx?kpid=4495&pqcatid=144&pqid=4481 Indulge mindfully.